See that guy? That is Martin, and today we visited his house. He is one of the chiefs of the Irwq tribe, the second largest group in Tanzania (after the Maasi). The Irwq (which is nearly impossible for English speakers to pronounce because it requires a guttural sound) are agriculturalists. The traditional Irwq house is built into the ground, due to a slight conflict with the Maasi who believe that all of the cows in the world belong to them. 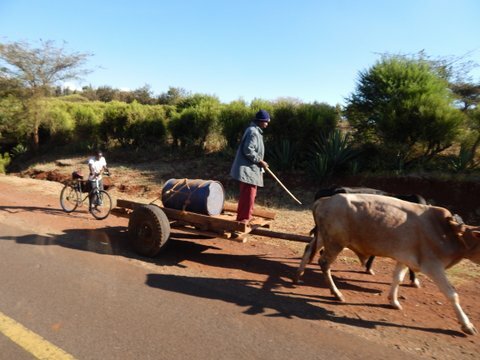 The Maasi would come to the Irwq villages in the middle of the night to “reclaim” their lost cows. To compensate, the Irwq started building their houses into the ground as dugouts so that when the Maasi would look for the Irwq houses, none would be visible. In 1974, the president of Tanzania said that the Irwq couldn’t build thier houses in this manner any more because it used a lot of trees, and he understood the need for conservation. To stop the conflict between the Maasi and the Irwq, the president declared if the Irwq could prove that their cows had been “reclaimed,” the government would give them 10 cows to replace it. This eliminated any hostilities between the two groups almost immediately. Martin (our friend pictured above) is allowed to keep his house because he and his tribe teach traditional crafts and ways to the Irwq people (and a small group of HMNS travellers), somewhat like a museum. 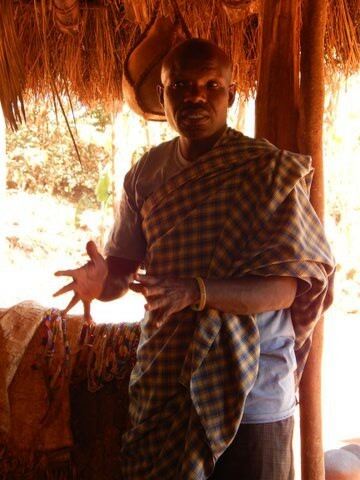 He taught us about two very important parts of his culture: beer making and wedding skirts. The “local beer” is super important and is prepared before any big job, ceremony or wedding. To make it, corn is ground and mixed with yeast and cane sugar or honey. Finger millet is ground and added to this after a few days. It is then boiled and left to sit for two days. On the third day, it’s ready. After trying the local beer, which I would say has the flavor of applesauce made from diluted vinegar, I think I will stick with Shiner. The other skill Martin’s wife, Victoria, showed us was how to make a wedding skirt. The skirt is made from dried goat skins. Once the skin has been dried out, a special tool is used to scrape off the hair. 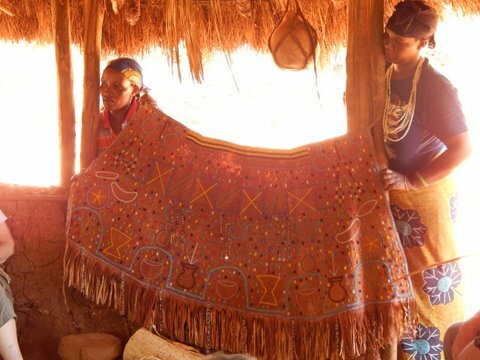 The skins are then cut into wedge pieces and sewn into an apron shape, and beading is applied. When Victoria asked for volunteers to try the beading, I hopped right up! Sewing is a skill I can get behind. The beading is similar in technique to Native American seed beading and every pattern has a meaning. The blue river pattern, Martin explained, is a metaphor for life. The river goes up and down, just as life has ups and downs. In the rounded patterns at the bottom you can see the tree of life, and just above those you can see a gourd shape, which represents a calabash. The colors have meanings as well. Yellow represents the natural resources and minerals, green for vegetation and black for the African people. The best part of the visit happened in the last few minutes. 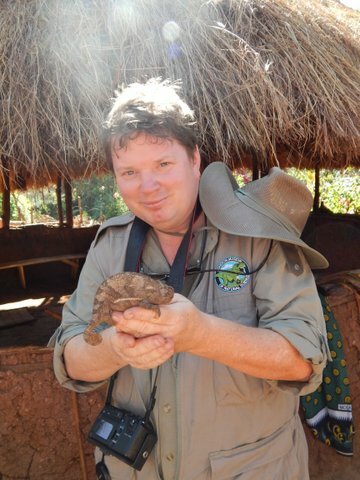 Some of the village children were playing in the bushes and found a chameleon. Apparently the kids are taught that chameleons are poisonous (maybe to keep them from bothering them? 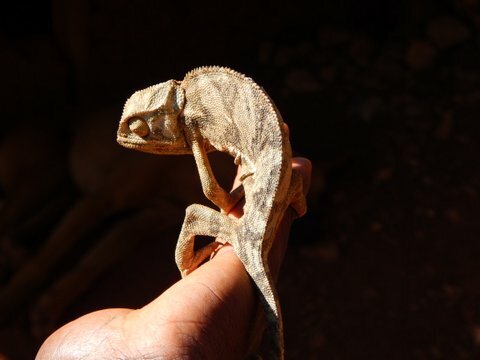 ), and I have heard a couple different versions of folk tales that say if a chameleon bites you, it won’t let go — and the chameleon becomes part of you. So the kids were willing to show us the chameleon, but from the far end of a very long stick. We, on the other hand, had no such worries, and you can tell by Dave’s face that he was tickled pink to get to hold it. thank you for your comments about the Wedding Skirts and the Beer. We also visited Martin’s house this last November and I did buy a wedding skirt and had it framed. fun to find your article. HMNS Unveils Ground-breaking Discovery: Soft Tissue from the Dinosaur Age!